A symbol of American freedom or school pride, this adorable plush eagle clip-on hooks easily to your keys, purse, belt loop, etc. This cute little eagle stuffed animal clip is sure to delight with its soft brown fur, white head, tail, and neck fluff, yellow beak and feet, and watchful eyes. 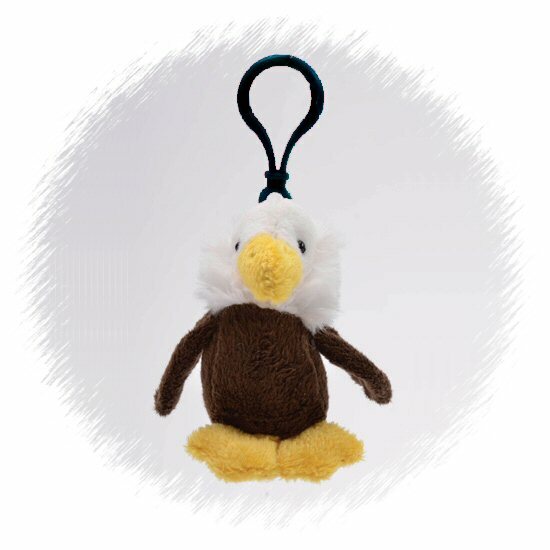 This eagle plush clip-on is the perfect take-along pal and would love to accompany you on your adventures whether it is on your key ring, belt loop, backpack, purse, or even looped around your finger. Fun Facts about Bald Eagles: Did you know even though the Bald Eagle is the United States' national bird, there was a time that it was almost wiped here? Thankfully, the number of bald eagles have increased, especially in Alaska.